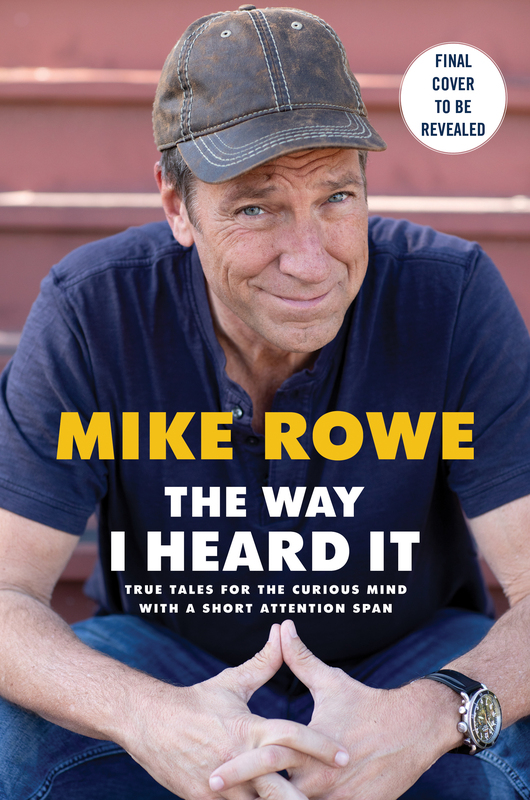 Hey Mike – So excited to see that you’ve finally written a book! I read the story and already pre-ordered a copy! I’m curious though – why did you choose a picture of you at a Romney rally? Is this a political book? Here’s what happened. Simon and Schuster prepared a press release that went to the Associated Press, along with a current photo of me; specifically, the one posted here, minus the copy. For whatever reason, that photo was rejected by the AP, and replaced with an image taken seven years ago in Ohio. Stranger still, was the oddly detailed caption that described the event as a “campaign stop,” for then presidential candidate, Mitt Romney. Friends of this page know that I don’t endorse political candidates. I run a non-partisan, non-profit foundation, and work every day on workforce related issues with individuals on both sides of the aisle. Seven years ago, I wrote to President Obama and Governor Romney about the goals of mikeroweWORKS. I told them about our efforts to call attention to several million vacant jobs, and offered to meet with both men to discuss ways we might work together to close America’s skills gap. Governor Romney responded by inviting me to a “non-partisan manufacturing summit” in Ohio, to meet with a dozen local business leaders. I accepted. Now it is true that this “manufacturing summit” turned into something more partisan than I was led to believe. Two months before the election, things heated up, and everything got super political. Lesson learned. But it’s also true that Governor Romney went out of his way on that day, seven years ago, to tell the media that I was not there to “endorse” him, but rather, to talk about jobs in the manufacturing sector for which my foundation provides training and support. Which is exactly what I did. But of course, none of that mattered, because a picture, as you may have heard, is worth a thousand words – even if those words appear in a caption with no context, seven years later. Anyway Deb, I can’t tell you why the AP would select such an old photo, along with such a potentially polarizing caption, to accompany the announcement of a book that has nothing to do with politics, written by a guy who had never endorsed anyone for elected office. Maybe it was just an oversight. But I know this much is true – there’s real money in keeping us divided. That’s why so much of what we read today is Rich vs. Poor, Black vs. White, Conservative vs. Liberal. Everyone must be put into a political box, and kept there. If you look for examples, you’ll find them everywhere. Is this once such example? Yes, I think it is. Was it deliberate? I don’t know. I hope not. PS. Speaking of my mother, the woman is out of control. She and dad are headed to Annapolis, where she’ll be appearing tomorrow with a bunch of other best-selling authors to answer questions and tell stories and do all sorts of bookish stuff. If you’re in the hood, stop by the Key School and tell her I said hello. Should be a hoot.